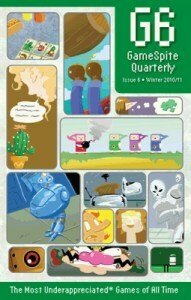 The sixth volume of Gamespite Quarterly went up for sale last week, and mine just came in over the weekend. You should definitely buy it - I am not saying this because I contributed to it, but because it is an excellent book. Last year, the second volume included a top 40 "best of" list, as voted by the site's forums. It was a damn good selection, but like most such compilations, it was missing some of my personal favorites - no Bionic Commando, and no Snatcher, mostly. This volume is a top 50 list of games that didn't get in the first time around, plus other under appreciated gems. Again, it's a good solid list of stuff, spanning three decades worth of gaming. Most of them are indeed underdogs, the kind that you could occasionally find people list in their "favorite games of all time" canon but not universally loved enough to make a list like this. Stuff like Bangai-O Spirits, God Hand, Ogre Battle, even Deadly Premonition. Entries 40-50 are pretty brief - mine's only 300 words - but the rest are fairly meaty, and anything with an expansive treatise on Zelda II (still the best Zelda game ever made, never to be surpassed) earns extra stamps of approval. Also, I had never realized that the whole part in Area 6 of Bionic Commando, where you have a scale a tower while avoiding a series of rolling balls, may have been a reference to Donkey Kong. Cool book, sir and I'm looking forward very much to HG101's adventure book, as you introduced me to MoonRemixRPG(Enough said). I hate to non-sequiter, but you're the only blog who might know this: In the FM towns Ultima 1-3, how do I toggle Japanese text, as the the default is english? A dumb question, from a dumb fellow. Thanks for ya'lls time. Maybe I'll get it around Christmas time, but for the next two weeks, I have to save up for Black Friday and the ridiculous cheap game deals that it offers...Sorry, Q6, I'll get you ASAP!...after Black Friday, of course. "Zelda II (still the best Zelda game ever made, never to be surpassed)"